CarGurus has 10,747 nationwide Cooper listings starting at $2,300. There’s not much left to say about the MINI Cooper’s “funky” styling or “cute” dimensions—or not much in the way of breaking news, at any rate. The rebooted model is now almost 15 years old and has grown into enough of a roadway fixture that it won’t turn many more heads than unabashedly staid cars like, say, Honda’s Civic (which is actually beginning to look more aggressive and attention-grabbing than the BMW-made Cooper). Models like the Nissan Juke and Kia Soul have taken the Cooper’s funky cue and run with it, while subcompacts like the Fiat 500 and smart fortwo make the Cooper look like a stretch limo by comparison. While it’s still a solid car, the MINI Cooper isn’t quite the beacon of consumer individuality that it used to be. The last redesign for the Cooper was for the 2014 model year, so buyers are looking at a mid-cycle vehicle for 2017. To keep anyone from yawning, MINI is introducing the MINI Seven, a special-edition package meant to heighten the model’s individualist appeal (and, presumably, its sales numbers). The Seven package will be available on both the Cooper and Cooper S and with 2 or 4 doors. The default exterior color is Lapisluxury (i.e. intense) blue, and Pepper White, Midnight Black metallic, and British Racing Green metallic are all available as well. The roof, exterior mirror caps, and bonnet stripes are all done in Melting Silver in order to set off the exterior color and styling cues. Special 17-inch light alloy wheels with a two-tone design complete the higher-end impression the Seven is intended to convey. Inside, the Cooper Seven’s seats have leather centers with fabric sides, and four color/pattern templates are available. A MINI Seven logo appears on the central instrument panel and a Piano Black high gloss trim comes standard, while three other trim choices are available at an extra cost. “Color Line” trim elements (air vents, instrument surrounds) add additional contrast throughout the cabin. Pretty much everything else about a 2017 MINI Cooper Seven depends on the standard Cooper trim you choose to underlie it. The base Cooper is a 2-door hatchback, followed by a 4-door hatchback and a 2-door convertible. These trims all use a 1.5-liter 3-cylinder engine producing 134 hp and 162 lb-ft of torque. A 6-speed manual comes standard, and a 6-speed automatic is available for about $1,500 more. Fuel-economy estimates for 2-door 3-cylinder trims come in at 28 mpg city/38 highway/32 combined with the manual; if you choose a 4-door or convertible configuration or the automatic transmission, you’ll see hits of about 1-2 mpg on highway and combined mileage. All MINI Coopers are front-wheel-drive (FWD) vehicles. Slotted above the base Coopers is the Cooper S, powered by a 2.0-liter 4-cylinder engine producing 189 hp and 207 lb-ft of torque. Transmissions are the same here as on the base trims. Mileage for the Cooper S convertible comes in at 25/33/28 with the automatic and 23/32/26 with the manual; the hardtops register a drop of about 1 mpg combined. The flagship John Cooper Works (JCW) trims—2-door or convertible only—use an up-powered version of the 4-cylinder for 228 hp and 236 lb-ft of torque, good enough for a 0-60 mph time of under 6 seconds. JCW trims equipped with the automatic transmission also include paddle shifters. Strangely, fuel economy for the JCW hardtop is listed the same as for the S, but the convertible’s mileage numbers drop to 24/32/27 with the automatic and 22/31/25 with the manual. The Media option package becomes standard on hardtop trims for 2017, bringing a 6.5-inch display with MINI Connected infotainment, Bluetooth audio, voice command, and a front center armrest. The S and JCW trims add sport seats, and a Harman Kardon premium sound system and panoramic moonroof are available with the Premium package. A Technology package adds a rear-view camera, navigation, an 8.8-inch widescreen display, and a beefed-up infotainment system. Although the MINI Cooper’s non-special-edition packages tend to add worthwhile equipment, they also add significantly to the vehicle’s price tag. Other options—such as leather upholstery—are similarly pricey. Most of the MINI Cooper’s noteworthy safety technologies are optional. These include an active driving assistant (with cruise control and automatic braking), a rear-view camera and rear park-distance control (when not already ordered in a package), a head-up display, and LED headlights with cornering lights. The 2016 Cooper hardtop received 4 out of 5 stars across the board in National Highway Traffic Safety Administration testing; the Insurance Institute for Highway Safety, however, rated the 2016 Cooper a Top Safety Pick+ (when equipped with the active driving assistant). Although the MINI Cooper’s options tend to be on the spendy side—the 2017 Seven special-edition package will run you $2,500—base trim prices aren’t too bad. The basic 2-door starts at $20,950 for the hardtop and $25,950 for the convertible. At the top end of the lineup, the JCW hardtop goes for $30,900 and the convertible for $35,600. What's your take on the 2017 MINI Cooper? TheHorror What was once an adorable little money pit, is now a bloated and grotesque one. 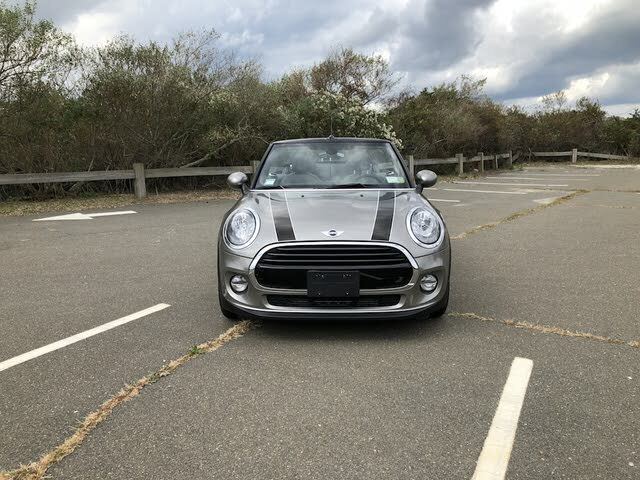 Have you driven a 2017 MINI Cooper? 2017 Mini Convertible-emissions Light Is On. How Do I Reset It? Who can make the car keys replacement for Mini Cooper 2017 model?